Three colourful and accurate game maps on heavyweight stock. 20 scenarios printed on separate heavyweight cards. 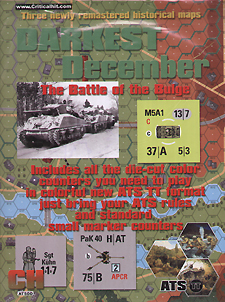 ATS TT Darkest December combat counters needed to play the scenarios (560 colour die-cut counters [2x148 pc. sheet} plus 88 BRAND NEW ATS TT large marker counters plus ATS TT vehicles/guns [2 x 88 pc. sheet]).